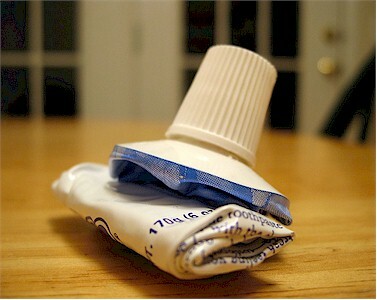 You could roll up the end, as you used up the toothpaste, to squeeze out every drop. The metal tube would stay rolled up, although sometimes it would crack or get punctured. freddo30 - we used it! In 1966 my dad's company had a neat little handout that was a key which fit the folded end of a metal toothpaste tube so you could roll it to the last little bit of product. He's 82 and I'm 60 and we just had a fun reminiscence about that the other day while griping about today's messy inefficient plastic tubes. Not to dispute an article from Popular Science but I can't imagine any company using lead in something you could ingest as it was known as a deadly poison long before toothpaste was ever marketed in a tube. It was originally put in a tin casing, then later switched to aluminum since tin could conceivably react with the toothpaste compounds. Plastic tubes replaced the aluminum ones because of its recyclability (so they say). Actually plastic tubes are cheaper to make than aluminum. I personally prefered the aluminum tubes as well. As all of us baby boomers know, new and improved translates to "a cheaper way to make it". Ayup - used to love to play with these. Still prefer those - so much easier to roll up till empty! Hate the plastic ones - can't seem to get that last bit out ever!